Lee has done an incredible amount not only for EDC, but for our community! Looking back, a short list of roles that she has played for EDC could easily be mistaken for the collective resumes of a whole team over the course of a decade. Among other things, Lee has been our board president, annual event chair, silent auction chair, development committee co-chair, 40th Anniversary chair, Khaleesi, all-star volunteer, leading ambassador, and dear friend. EDC Executive Director, Owen Bailey, and Lee Heller at EDC’s annual fundraiser, Green & Blue, on June 4, 2017. Lee found her way to EDC after taking a course from Linda Krop at the Santa Barbara College of Law – yes, Lee is a lawyer. Inspired by Linda and driven by her love of the environment, starting in 2003, Lee joined us twice as a law clerk, researching issues including conservation of Ellwood Mesa and the need to clean up the debris left when Chevron removed oil platforms off the coast of Summerland in the 1990s. At that time Lee also began volunteering at our annual event, the role for which she grew to be best known to most EDCers. Eventually, Lee served on our Board for five years (one of countless boards on which she served) starting in 2011. Once on the board, she took a larger and larger role in our annual event, which had by this point gone from being called Celebrating Paradise Saved to Green & Blue: A Coastal Celebration. Starting in 2013, Lee fully took over our silent auction, transforming what had been a nice, dependable centerpiece of the event into the major fundraising vehicle people enjoy today. She did this through persistence, skill, and occasionally blackmail. I recall distinctly the day Lee told me she would resign as chair of Green & Blue if I was not smart enough to purchase the supplies she required for the auction displays. Over the last few years, she rebuilt the auction’s volunteer team, doubled the revenue the auction earned, and quintupled the canine participation in committee meetings. Along the way, Lee has been recognized multiple times inside and outside of EDC. 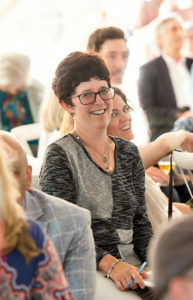 She was of course EDC’s volunteer of the year in 2013, and was also named both the Cox Conserves Hero for 2016 and a Santa Barbara Independent Local Hero that same year. As one would expect from a hero, Lee never seeks accolades. Instead, she just does the work that needs to be done day after day. Of course, this work additionally included finding dogs for both Linda and me – or rather finding humans for both Josh and Cyrus. Oddly, EDC’s parking lot also pays homage to Lee with staff driving two of her “retired” hybrids. Lee may be moving far across the sea, but the gravitational pull from her vast network in our community and all the organizations and causes she champions should drag her back into our orbit regularly. Her time away will leave a big hole for us to fill organizationally and personally. We wish her well and wish her great happiness, and hope she comes “home” soon and often.